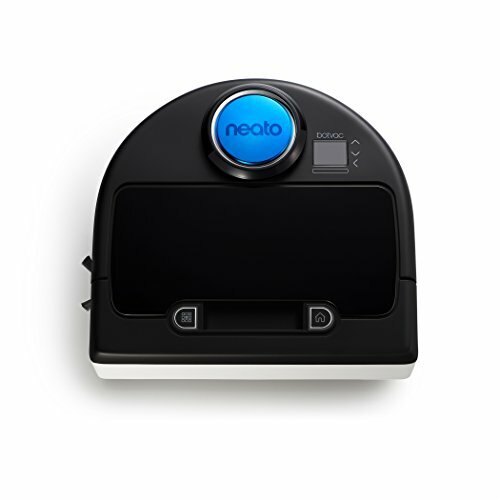 Smart, powerful, high-performance Robot vacuum. Great for homes with pets. While you do other things, Neato BotVac vacuums dirt, crumbs, dust bunnies, and pet hair from all floor types and every corner of your home. D-shape with corner clever - exclusive d-shape with corner clever technology destroys dirt where it hides and keeps corners clean. Extra large bag less dirtying and Jumbo high performance filter capture particles as small as 0.3 microns, like mold and pet dander. Perfect for all floor types and pet hair pick-up. Auto-charge & resume lets your robot clean room to room - when it needs more power, it automatically returns to charge, then returns to where it left off & finishes the job. LaserSmart mapping and navigation system scans and maps the room, plans, and methodically cleans-instead of bumping around. D-Shape design with CornerClever technology gets close to walls and into corners. Maximum hair pickup. Picks up more pet hair than other bots. SpinFlow Power Clean combines potent suction and precision brushes to leave floors immaculately clean. Includes both combo brush, spiral blade brush, and side brush. Auto-Charge & Resume lets your robot clean room to room; when it needs more power, it automatically returns to charge, then returns to where it left off & finishes the job. Kindly refer the user manual given below for product information. No international Shipping.•	Be sure the charging base has 3' of clearance of both sides. This facilitates the robot returning to base without issues. If you have any questions about this product by Neato Robotics, contact us by completing and submitting the form below. If you are looking for a specif part number, please include it with your message. Marathon Dispenser Roll Towels 12 Rolls for Marathon Commercial Kitchen Bathroom Towel Dispensers Bulk Case 4,200 ft.